← Delifrance Secret Santa: Sweetest Free-est Treats! 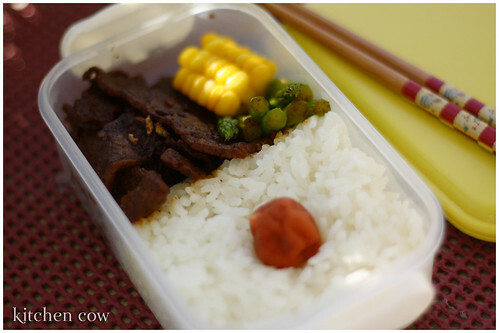 Remember that Soy-Butter Beef recipe I shared in the previous bento? Well, I really really liked it, so here it makes its appearance again, just two days after the previous one. There’s so much to like about it. How easy it is to make, as well as how fast. But for me, the number one reason is the taste. I really love how it tastes! So, expect this one dish to make repeats in many more bento to come. Aside from the deliciously addictive stir-fried beef, I also threw in some buttered asparagus spears, a quarter of corn on the cob and some rice topped with umeboshi (pickled plum). The umeboshi’s mainly for show. It’s a spot of bright color that I can enjoy nibbling after the meal. The veggies however, are a pleasant complement to the beef. The asparagus add a nice, refreshing crunch while the corn add a touch of sweetness to the meal. It does look delicious. Don’t eat it too much or you will burn out! I don’t think I can ever get tired of it! But yeah, I am trying to give myself ample breathing space between meals, heehee.